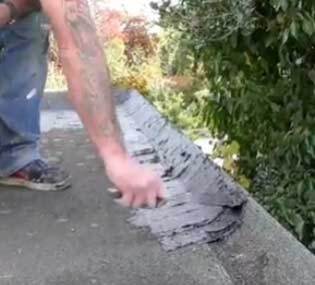 Repairing flat roofs usually involves patching the roof with various bitumen products, tapes, flashband and mastics time and time again until the owner finally gives in and re-felts the roof. Until now, re-felting has been the only effective flat roof repair method. 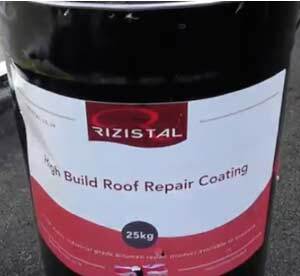 Enter Rizistal and their range of flat roof repair products and this review, focussing on the High Build Roof Repair Coating, will show you just how good these products are. Why do Flat Roofs Leak? Flat roofs leak because they were either not laid properly in the first place, a layer of limestone or granite chippings was put on the roof to protect against the sun and this layer has been walked on, puncturing the felt, or the UV rays from the sun have literally dried up all the plasticity in the felt and it’s adhesive. Subsequent expansion and contraction of the roof’s structure have split the felt. The felt can be split in one area of the roof, but because of the boarded nature of most felt roofs, the leak can forge it’s way under the felt and become evident metres from the leak. Furthermore, the water can be held under the felt for some time on a roof which does not slope much, and this can continue dripping even after you have spent ages with a tube of mastic repairing the leak. It’s even possible you actually have repaired the leak…… but because of the drips you think you haven’t! 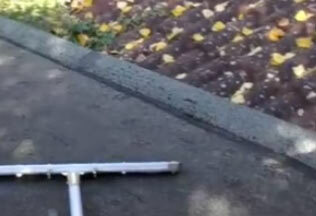 What’s the Best way to Repair a Felt Flat Roof? In years gone by the only way to effect a really good repair was to strip off the felt and start again. That was until a company called Rizistal came along with two amazing products which are designed to cover splits and cracks in existing flat felt roofs and provide a fully waterproof, flexible covering which will last a very long time. 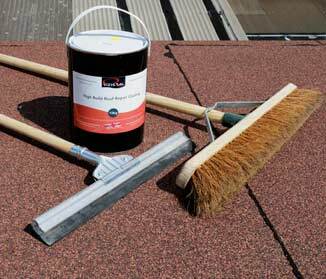 We took a look at these products and this review deals with the High Build Roof Repair Coating. The other product, and review, is the Acrylic Polymer coating which is dealt with in the link. Comparisons will be drawn in both reviews. What is High Build Bitumen Repair? High Build means exactly what it says on the tin. It can be applied quite thick so there is a much greater chance of a uniform, waterproof coating. 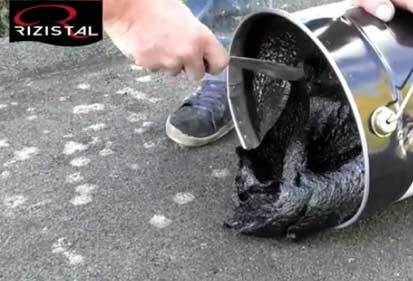 The bitumen itself is a mixture of bitumen resins, oils and rubber compounds. These are combined with fillers and fibre reinforcing which gives the already thick bitumen, it’s high build qualities. It is absolutely ideal for smaller flat roofs whereas the Acrylic Polymer coating (which you can read about here) is designed to cover larger areas and last a bit longer. How Does High Build Bitumen Repair Work? 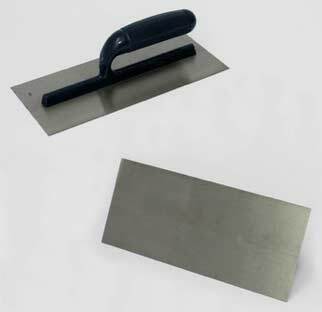 The coating can be poured from the container and spread using a squeegee which is also on sale from Rizistal. However, we found that the bitumen is such good quality and so thick that using a squeegee did not yield the best coverage which incidentally, is 0.5m per litre when applied at 3mm (recommended) thick. We used an ordinary plastering trowel which gave us much greater manoeuvrability and allowed us to get maximum coverage from the can. Click on the image to see the finishing trowels from Rizistal. The fibres in the high build coating hold the whole thing together and providing you have removed any huge areas of loose, flapping felt, will push down into existing cracks and fissures to give you, as it did us, a totally waterproof, flexible covering. Because it can be laid on up to 3mm thick it allows you also to get a smooth, flat surface. This stops water pooling and aids a great run-off to the gutter. Pooling water freezes and even boils in the extremes of temperature we get in the UK so the smoother the surface we create, the better chance there is of getting rid of the water. As mentioned, putting a thicket coat onto the roof will enable you to achieve a much smoother surface. Not only does this allow water to run off more easily, but it allows you to see at a glance that there are no splits or cracks left in the felt. It can be applied directly over the top of existing felt and trowelling it in makes sure you have covered every possible crack. As you can see we first went round the edges of the roof with the bitumen, laying it on with a wide scraper. This could just as easily been done with a trowel but our labourer had just dropped it over the roof and had been sent down the ladder to get it! We tried a squeegee to lay on the rest of the roof covering and it worked well. Because of the quality of the bitumen however, we did not really get the “feel” of a uniform covering. It was also much harder to gauge the depth with a squeegee, so we switched to a trowel. 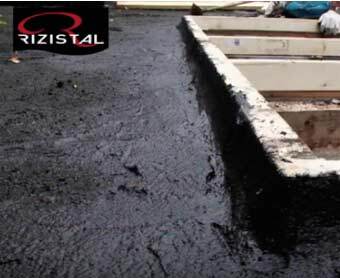 We found out from Rizistal that the high build bitumen offers great resistance against acid rain and will not break down. This is important as it will then keep it’s plasticity and flexibility regardless of temperature variations. Walking on this surface, after it has cured (24 hours) is not a problem either. You can pop up and get the kids toys and footballs with no harm done to the surface. Just to be on the very safe side we recommend covering the finished roof with Rizistal’s solar reflective paint rather than the old idea of covering with granite or limestone chippings. What can I Repair with Rizistal’s High Build Bitumen Repair Coating? 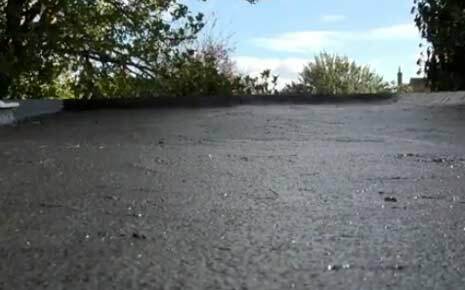 This bitumen coating is not limited to felt flat roofs. 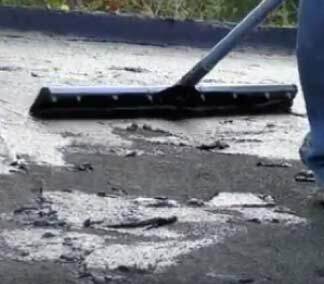 Providing you have cleaned and prepared the surface, it can be applied to Roof tiles, Natural slates, Asbestos, faux asbestos, and asbestos cement sheeting. It can also be applied to aluminium or galvanised metal sheeting. There are not many types of roof it cannot repair! We have yet to use a Rizistal product we do not like! This is no exception. Providing the surface is cleaned before application and all loose material is discarded, this bitumen covering is wonderful. It is so thick that you know, as you are laying it, that it will move in whatever direction the roof wants to take and it will not split or crack while it is doing it! Another great product from Rizistal.